Many thanks to Alan Brown from whom we received this update on Bakst (2000 by Dante x Branta) who won the AHS marathon in 2011. “After the marathon in 2011, Bakst went on to do two FEI 1 star races (80 km) in 2012 at King’s Forest and then Euston Park, both of which he won fairly easily. We then did a 2 star (126km) which was progressing satisfactorily until I was forced to retire as a result of dehydration and heat stroke; needless to say Bakst had passed the vet but his rider did not. Unfortunately in March 2013 he was diagnosed with a suspensory ligament injury which caused the loss of the entire 2013 season and a little beyond. During that time, after four weeks box rest, I was able to walk out and gradually increase the distance and bring in trotting and later canter, but no fast work. With the clear scan in March this year I could commence fast work. 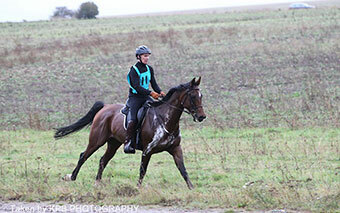 I then did two graded rides before entering the FEI 1 star at Barbury Castle, which was held yesterday. I was unsure what to expect of Bakst, not knowing for certain how fit he was. I need not have been concerned as, despite the presence of about 7 UAE riders, he duly won again. It was not easy as two of the Emirates riders finished the second loop with me but, because of their extremely professional crewing arrangements, they presented to the vet slightly before me and therefore were able to start the final loop before me. Bakst gradually caught them and we then proceeded at a tremendous speed until we just won in the end. This was quite an achievement as the UAE horses are professionally trained and ought to be fitter. However, Bakst has real speed and can sustain it almost indefinitely.